First off, if you haven’t read Part 1, the USA border to La Paz, you can read it here. To start Part 2 off, we head east out of La Paz on Mex 286 towards the town of San Juan de los Planes. Just east of San Juan de los Planes the highway makes a sharp turn to the left, but for a more exciting route, just continue straight onto the dusty track that heads up into the Sierra la Gata. This track doesn’t get a lot of use by vehicles, at least when we took it, but it does see some moto and ATV use. Also, there are a couple of narrow sections where the road washed away that may be a tight squeeze for larger trucks. This being said, it’s a fun route with a few low range rocky climbs, winding narrow descents, sandy washes and finally, a great view of Bahia Los Muertos. As a side note, we did have an amusing experience in one of the washes before Bahia Los Muertos, while enjoying breakfast and coffee. A Volkswagen Jetta came driving by us, heading up the wash towards the mountains we came from at good speed, bottoming out along the way. I knew there was no way they were going to make it much further and nervously, I figured it was a few car thieves with a stolen car, while Claudia figured it was lost American tourists with a rental. I was hoping for choice B and fortunately, choice B it was. After about 10 minutes, a college age guy came walking up, said he and his friends were hung up on a rock and asked if we had a shovel. Apparently a local told them this was a short cut to La Paz and while they beat the hell out of the car, they made it further than I would have thought possible with that rental. After finishing breakfast, Claudia and I went up to see how they were doing and saw they didn’t make a lot of progress, so I offered to give them a hand. After some work with the shovel, Hi-Lift jack, sand plates and a pull from the Land Cruiser, they were free. There was quite a bit of damage to the underside of the car, but no fluids were leaking and it still drove, so they thanked us and headed back the way they came. I really wish I could have been there when this rental was returned. Anyway, back to the route. After a following a twisting path that hangs well above the coast, the road descends to the Sea of Cortez and the vacation homes begin. 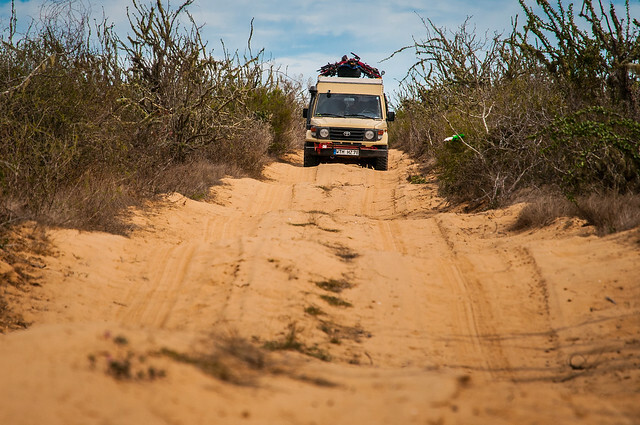 A maintained, dirt road continues south to Los Barriles and there are a few sand washes that offer beach access, but from here, all the way to Cabo, the shore gets progressively more developed and there are a lot more fences keeping you out. 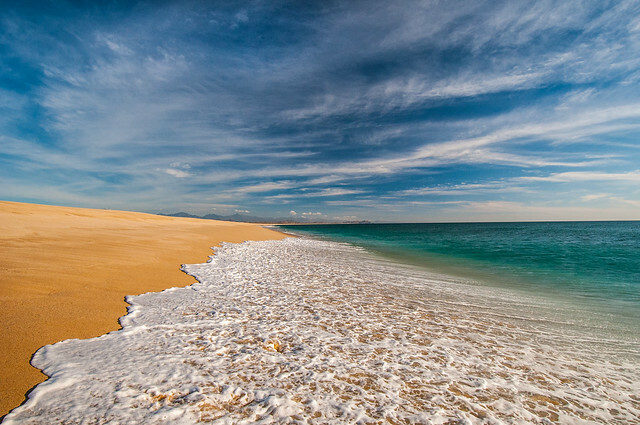 and the Cabo Pulmo National Marine Park, home to the only Pacific coral reef in the Sea of Cortez. 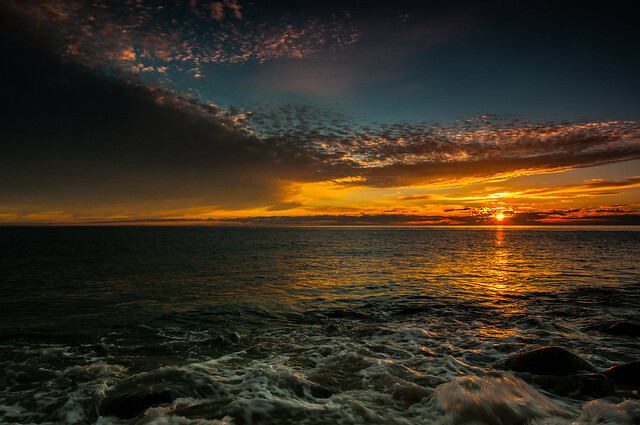 For us, after arriving in San Jose del Cabo we headed north on Mex 1 back to La Paz. We ordered a pair of drag link ends to replace the worn out ones we had been carefully milking along and we needed to return to La Paz to receive them from UPS. In addition, quite a few little repairs had been put off over the months, so after a long drive, we found a campground and I got to work. 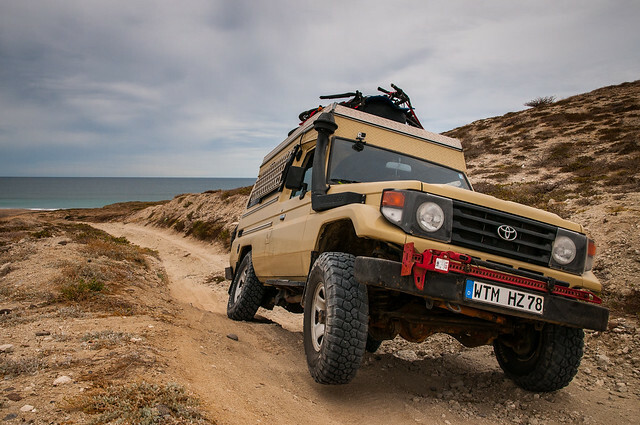 After two days of Land Cruiser repairs, it was time to continue where we left off, so we headed south on Mex 1 to Mex 19 and finally to the town of El Pescadero. The Nat Geo map shows a route heading east through the mountains that comes out just north of the airport in San Jose del Cabo and after asking around, we found the beginning (coming from Mex 19 it’s a dirt track heading left by the baseball field). The track follows sand washes and climbs a few hills on the way to El Refugio and from there things get a little vague. We were not using a GPS at the time, so with old fashioned map and compass skills we found the track heading south, but it hasn’t seen much use. Large washouts cross the road and deep gullies need to be straddled. This is the norm for the next 8k, until the junction with the road to El Aguaji. The road to El Aguaji actually starts about 10K further south of El Pescadero on Mex 19 and in hindsight, may be a better choice to begin this route, at least for now; road conditions in Mexico are ever changing. 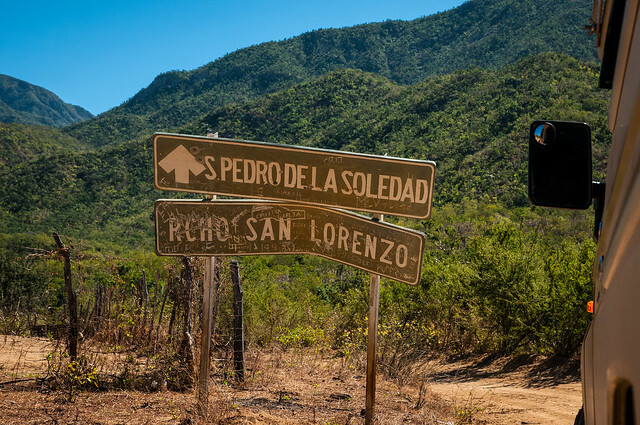 After reaching El Aguaji the road begins to climb and wind its way through the Sierra La Laguna mountains to the tiny town of San Pedro de la Soledad. Small ranches, great views, roadside shrines and few people are mostly what you’ll find along this route as it rises and falls through the mountains. Once reaching San Miguel, the road starts to descend towards the town of Casas Viejas and an intersection with a road heading to the left. 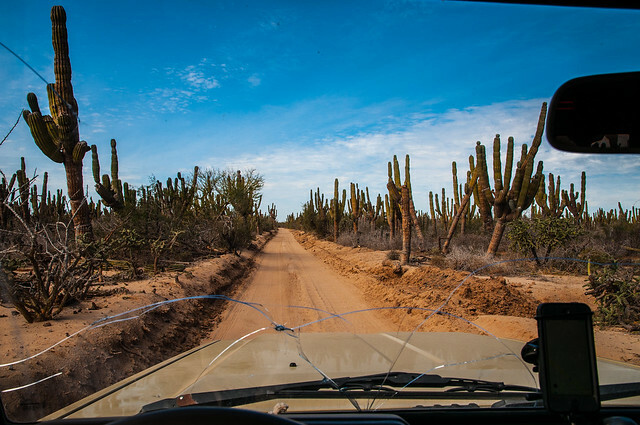 This road isn’t shown in the Nat Geo map we have, but is shown on our other maps and leads to the town of Santa Anita, where it joins Mex 1 just north of the San Jose del Cabo Airport. Road conditions are good, with the exception of a few damaged bridges, but keep an eye out for the kilometer of speed bumps starting about 4k before Mex 1; they blend in with the road and sneak up on you. Also, it appears some major grading and widening has been done to most of this entire route in recent time and at least when we drove it, it was passable in two-wheel drive. 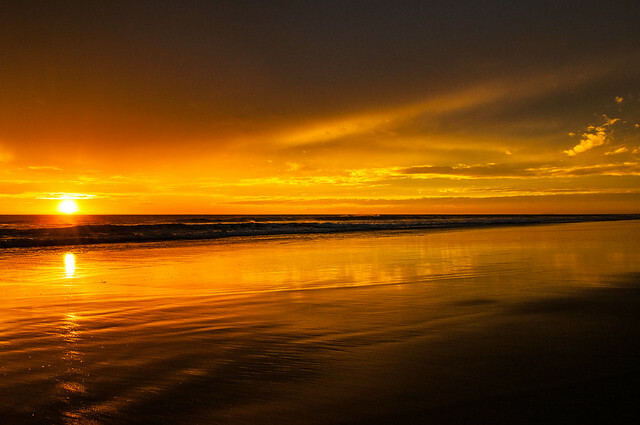 Once you arrive at the southern tip of Baja, from San Jose del Cabo to Cabo San Lucas, the rural Mexican experience disappears and is mostly replaced by Big Box Store America and cheesy souvenir shops. If a medium French-fries for about $9.00 U.S. (yes, nine dollars) sound expensive, it is, but you can get them in Cabo San Lucas. Also, for reasons unknown to me, but I have my suspicion, our Land Cruiser ran rough and had less power running on the diesel that we purchased along the Los Cabos Corridor. 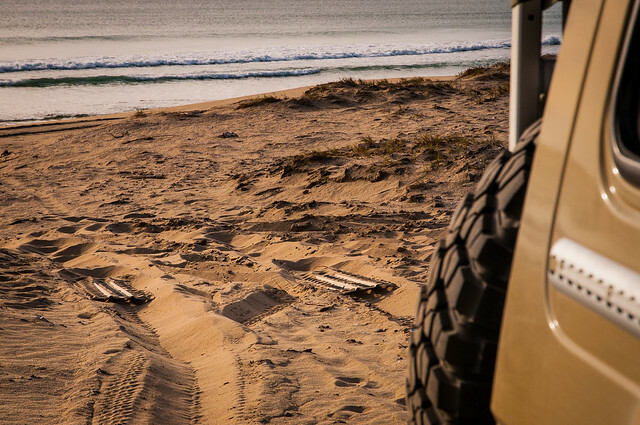 Anyway, once through the corridor and heading north on Mex 19, the homes thin out and some beach camping spots appear, but make no mistake, you’re still in vacation land and seeing rental ATV’s on the beach is common. Looking at the map I saw a long route heading along the coast north of Todos Santos that linked a few surf spots and tiny towns, but not much else; just the type of route we love. Also, after checking the App Store for offline maps of Mexico and discovering the app Maps.me, we officially leapt into the 21st century of GPS navigation. Maps.me is based on Open Street maps and surprisingly, many of the out of the way routes are covered. Now, as mentioned above, roads in Mexico are ever chancing, so just because it’s listed as a road on Maps.me, doesn’t mean is passable. before it winds its way through forests of cactus and along fences lines. Somewhere around San Sebastian, in search of a beach camping spot, we took an alternate track towards the coast that, after driving a ways, we found out it was in need of some roadwork. There was a washed out area that we needed to get around, but the sand was the consistency of talcum powder and would hardly support the truck on a side slope. Filling the gap with rocks, talcum sand, some scrap wood and bridging the gap with the sand plates allowed us to pass. and this was not the end of the road repairs or sand plate use on this route. but were able to back out and continue on. 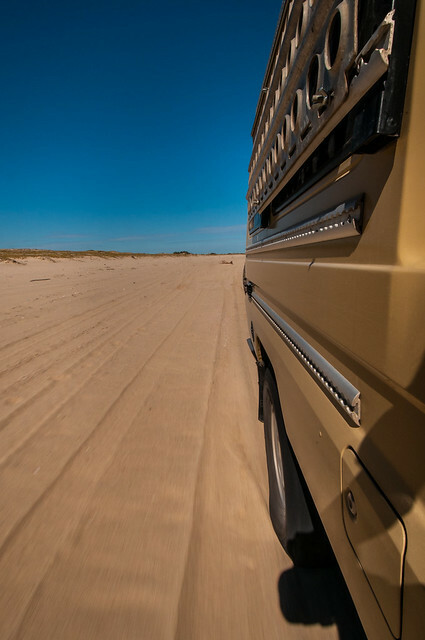 The sand had so much resistance, low range second gear was a struggle and many parts the Land Cruiser could only manage first. Regardless, we eventually made it to the exit and it was still better than finding an alternative track and besides that, it was fun. The final tough section comes just before Punta Conejo and involves climbing over the hill to El Conejo. The main track is badly damaged and with a top-heavy truck, was pretty challenging. but in the end decided to retreat and try the alternative track. Track B is a steep, loose rock hill climb that once on top; I wouldn’t want to have to drive back down, but with lockers It wasn’t a problem. Once on top, a dusty, winding road took us to El Conejo. Heading up the coast from El Conejo, the conditions of the route do not improve, at least when we were on it, so upon reaching Flor de Malva, we decided to turn around and take the easy route out to the pavement of Mex 1 just north of San Agustin. Our goal was to go to San Carlos so after driving the Mex for some distance, we made a left towards the coast just outside Santa Rita. Hoping to get to Bahia las Almejas, we tried a few tracks, but just ended up finding gates and dead ends. Not wanting to continue north on the pavement, we found a track on the GPS and followed SCORE racecourse markers towards Bahia Magdalena. 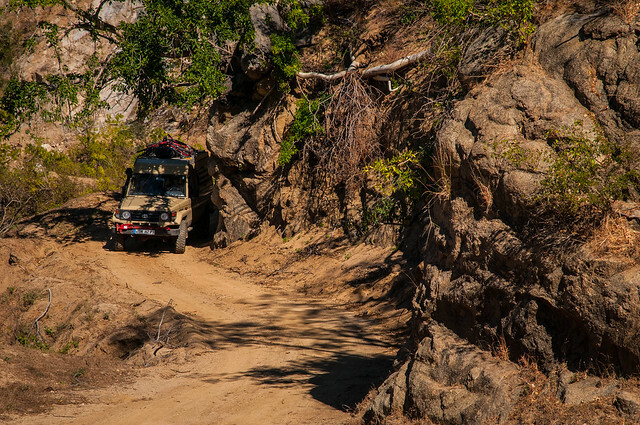 Along the tight sections of the course, there are not many places for vehicles to pass without driving into the bush, but fortunately, not many people use the course outside the races. The whoop-de-doos, on the other hand, will test your suspension and your patience to the limit. but also had some great camping and one of the better beach camps of the trip. 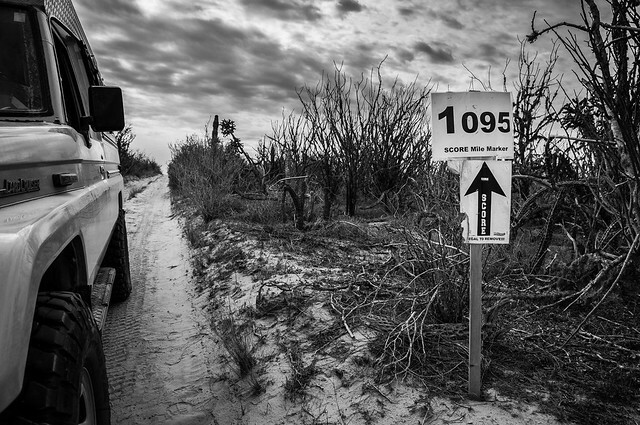 After Puerto Cancun all the driving is inland and there are very few tracks that head to the coast, but keep an eye out for the ones that do, because at least the one we took, lead to high sand dunes and a secluded beach. Once the whoop-de-doos lessen, the track intersects with Mex 22 where a left takes you to San Carlos and a right takes you to Ciudad Constitucion. Thanks for reading and stay tuned for Part 3 covering our route back north to the USA border. Brilliant photos….good story line…hope to follow in your foot steps next winter. Do you use a hydrophobic filter funnel when you fill your tank or have you considered filling your 5 gallon jugs and then pumping through a 1 micron fuel filter into your tanks? Thank you, I’m sure you’ll enjoy it down in Baja. If you are referring to the diesel tanks, we just fill right from the fuel pump. 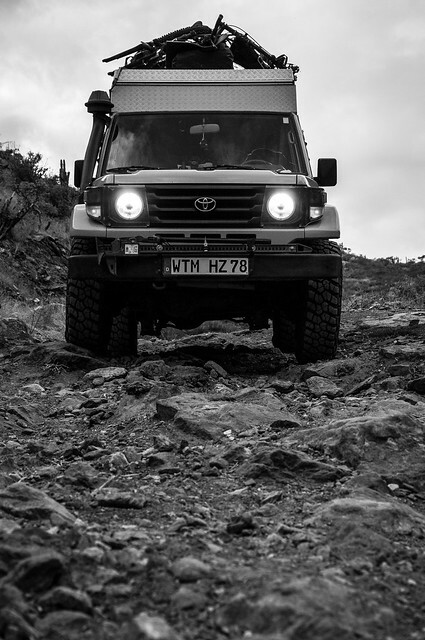 We do carry three extra fuel filters and quite a few bottles of HEET diesel water remover in case there is a problem, but it’s an older Land Cruiser and not very sensitive to fuel contamination. In fact, it runs better on “dirty diesel” than the low or ultra low sulfur diesel commonly found in North America.